Our affiliate company Advance Web Solutions has just released their new social bookmarking pages on Tumblr and Delicious check them out now. Also remember to subscribe to the feed for up to date information on web design news! We’d like to welcome our latest SEO client Will Vo . Will Vo is a real estate agent in Calgary and a lifelong Calgarian. Will helps his clients buy the perfect home in the Calgary area and sell houses with the best results. Call him at 403-614-7827 for more information! One of the most interesting challenges I’ve have when working from home was not actually “getting work done”. Instead it was more about how do I resist the urge to go to the fridge every hour when it is sitting just metres away from my computer. This may not sound like a big deal but fitness affects performance, and when you are not eating healthy (or too much) you can start to feel a bit sluggish. Working a full eight hour day takes discipline as a self-employed individual, so one of my keys to success is my afternoon workout from home. I’m someone who has a very productive morning then my energy kind of tails off in the second half. Luckily I have a treadmill at home along with some very simple gym equipment that helps me out. I’ve been able to merge both cardio and weight training in one somewhat intense 30 minute workout. I do a brisk walk to mild jog on my treadmill while using my Jogflex muscle toner at the same time. The running gets my cardio in the Jogflex does an upper body workout while I am running at the same time. This actually stops you from zoning out on the treadmill since your body and arms stay active. Once the 30 minutes is up and I’ve broken a good sweat I am usually recharged for the second half of the day. This is a big boost in making sure I get the most out of my full work day and so far is keeping me out of the refrigerator as well. If you have any work from home tips feel free to leave your comments below! Social Media Examiner is still one of my favorite websites when it comes to social media news, tutorials, articles and more. I even attended one of their online bootcamps which lasted about with a lot of great information from many top notch professionals in the industry. 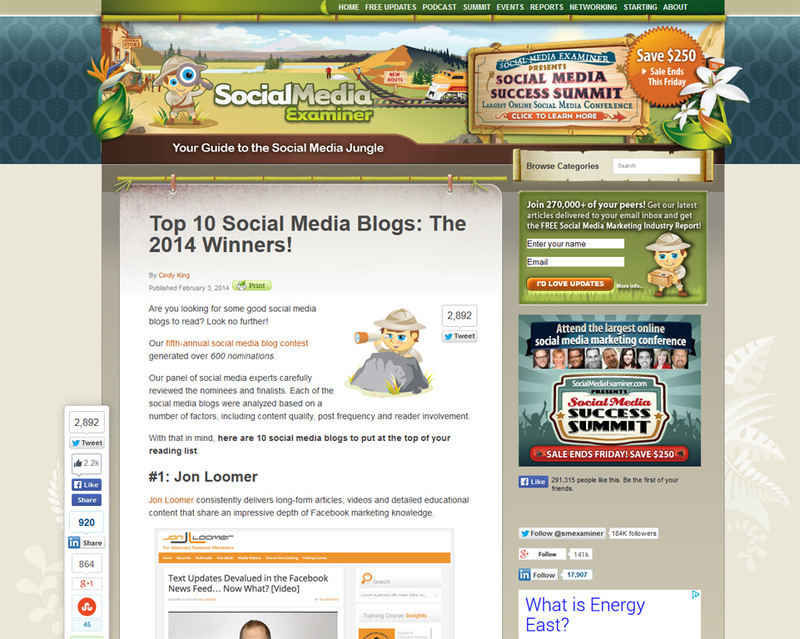 Top 10 Social Media Blogs: The 2014 Winners! The Calgary Web Design Network since 2007 has always been looking for exciting ways to expand to help our clients. Although we have done SEO with great success in the past we now are proud to debut our new standalone company My Rank SEO! 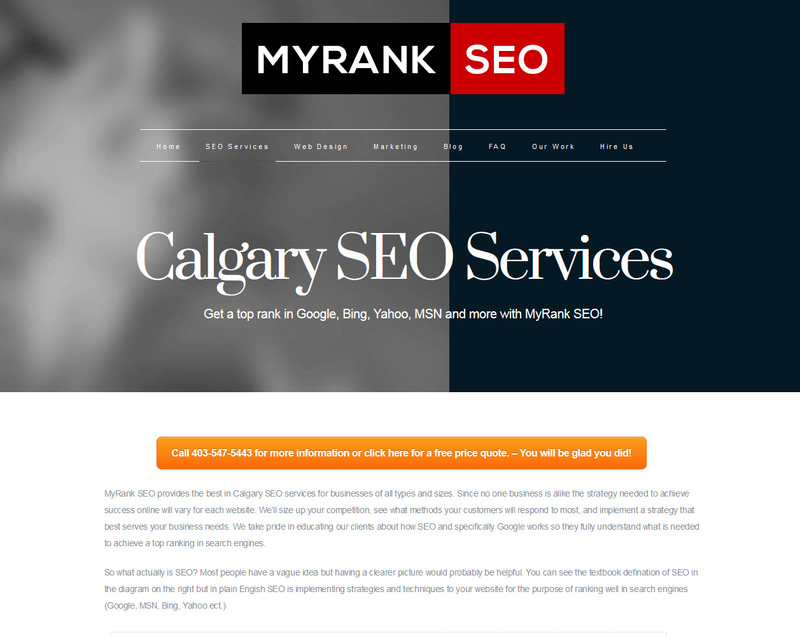 My Rank is a calgary seo & internet marketing firm all about getting you to the top of search engines and driving quality leads and traffic to your website. We don’t only specialize in SEO but other forms of internet marketing as well such as social media marketing, PPC (Pay-per-Click Advertising), video marketing and more. Check out our new website at My Rank SEO to learn more about us and what we can do for you! LinkedIn is today’s top business networking website and where business professionals of all kinds migrate in hopes of making new connections and creating new business opportunities. It’s estimated there are now over 200,000 million Linked is users and it joins Facebook and Twitter as one of the world’s top social networking websites. Once upon a time not that long ago internet marketing didn’t exist and advertising your business seemed a lot simpler. People advertised through more traditional methods such as newspaper ads, flyers, door to door salesmen and yes the Yellow Pages… remember those? Back then you didn’t have to worry about things such as search engine results or social media campaigns. Now we live in a different age where the internet rules all and is the first place customers will look when trying to find your product or service. The transition into the digital age for many is an ongoing learning process so having a little help along the way never hurts.